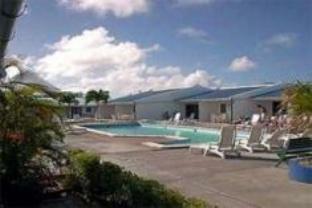 ﻿ Best Price on Aruba Blue Village Hotel and Apartments in Noord + Reviews! This tropical hotel is located on this island of Aruba and is within a 5-minute drive of the white sands of Eagle Beach. The small hotel is adjacent to the Madamme Jannette restaurant, and offers free WiFi throughout the property. Guestrooms feature a private patio overlooking the outdoor pool or gardens. The rooms have cool tile floors and air conditioning. The tour desk can help guests explore the island and offers options for activities including tours of the island and diving or snorkeling. Free daily shuttle service is available to the beach and downtown from 2:00 to 3:00 pm. Upon check-in photo identification and credit card is required. All special requests are subject to availability upon check-in. Special requests cannot be guaranteed and may incur additional charges. Please note the reception is open from 8 to 21 hr. Our stay at this hotel was horrible. We booked 2 nights in December and ended up leaving early after the first night. We checked in around 8, the receptionist was very friendly. However, when we went to bed around 11, we were unable to sleep throughout the night and awoke every hour. The walls between the rooms are very thin and you are able to hear everything including the faintest conversation. We also were unable to sleep due to noises from people outside the room along with fighting/howling dogs and screaming chickens/roosters throughout the night. The beds and pillows were extremely uncomfortable. There were lizards crawling on the walls (The ceiling tiles were open in multiple areas for some reason and I am assuming this is how they got in). The AC is only located in the bedroom and requires the room key to be turned on. So if your roommate leaves with the key, the air conditioning will not work. After such uncomfortable sleep, we ended up leaving in the morning and forfeiting our second night's payment due to being unable to cancel the reservation. The only good thing about the hotel was that it was located next to Madame Janettes (an excellent restaurant). I would never recommend this hotel to anyone. Bra, finns lekpark och grill möjligheter.